This entry was posted in Roles & responsibilities on 2017/01/25 by Susan. Even though they’re exposed to some very loud machines, most B.C. forestry workers aren’t getting annual hearing tests as required under the province’s Occupational Health and Safety Regulation. Hearing damage can occur when people are regularly exposed to sounds louder than 85 decibels – the equivalent of sustained traffic noise. But noise levels on forestry operations go much higher than that, as you can see in How loud is it?, a new publication from WorkSafeBC. OHS Regulation Part 07: Noise, Vibration, Radiation and Temperature requires employers to have a hearing loss prevention program in place when workers are exposed to hazardous noise levels. Requirements include providing personal protective equipment (PPE), training workers, and paying for annual hearing tests. Yet most workers are not getting the annual tests. WorkSafeBC audiologist Sasha Brown says only 24 percent of workers in the forestry subsector had a hearing test in 2015. This is troubling news, because without the hearing tests, employers will not know if their hearing protection measures are working. Employers will know their program isn’t effective if workers show signs of hearing loss, Sasha says. She and her team want to know more about what’s stopping them from getting their workers’ hearing tested. Some blame it on their remote locations, but Sasha says a way around this challenge is for workers to be tested in nearby towns when they return from their camps. For the workers, it’s important to detect noise-induced hearing damage early, so they can take action before it gets worse. They can work with their employers and audiology technicians to choose the right hearing protection and take other measures as needed. 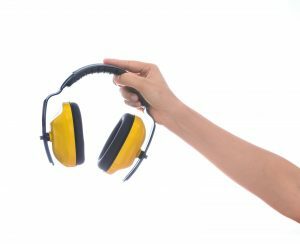 Of the 24 percent of workers who had their hearing tested in 2015, 13 percent reported they were not using any hearing protection. Sasha says that’s a fairly typical number for other industries too. Let’s hope this changes, because hearing is a precious gift that can be stolen so gradually you don’t even notice it.